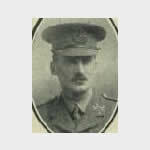 Lieutenant Cyril WINTERBOTHAM was born 27th February 1887, in Cheltenham. Educated at Cheltenham College and Lincoln College, Oxford where he gained a Law degree. He was listed as a member of the Inner Temple. He was Commissioned in September 1914. He was killed when the Battalion, without support, attacked German positions near Mouquet Farm near Ovillers-la-Boiselle. His body was not found and identified and he is listed on the Thiepval Memorial. Winterbotham was a war poet and his poems were privately published in 1917. He was also a joining member of OLD CHELTONIAN LODGE NO 3223 (London) on 4/2/1913 and of DONERAILE LODGE NO 3558 (London) on 11th March 1913 and resigned 9/11/1915. The Battle of the Somme 1st July - 18th November 1916 is inevitably characterised by the appalling casualties (60,000) on the first day, July 1st 1916. Having failed to break through the German lines in force, and also failed to maximise opportunities where success was achieved, the battle became a series of attritional assaults on well defended defence in depth. The battle continued officially until 18th November 1916 costing almost 500,000 British casualties. German casualties were about the same, and French about 200,000. The Somme could not be counted a success in terms of ground gained or the cost, but it had a strategic impact as it marked the start of the decline of the German Army. Never again would it be as effective whilst the British Army, learning from its experience eventually grew stronger to become a war winning army. The German High Command recognised that it could never again fight another Somme, a view that advanced the decision to invoke unrestricted submarine warfare in an attempt to starve Britain of food and material, and in doing so accelerated the United States declaration of war thus guaranteeing the eventual outcome. 287 Brethren were killed on the Somme in 1916.